How to measure your lower leg in order to have your custom wrestling boot made correctly for you. It is important for us that you give your correct measurments of your leg dimensions when making your order. 1:- The height of your boot will be the measurment from your lower heel to your mid calf. This will be approx 32cm. 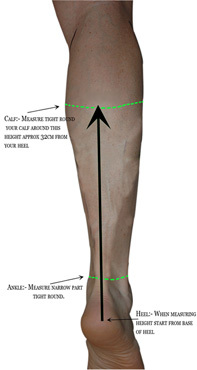 2:- Measure tightly around your mid calf, this is the upper green line on the picture to your right. 3:- Lastly measure your lower ankle point again tight round as you did in step two. This is the lower green line on the picture to your right. Please click on the image to see a larger size to indicate clearly these instructions and email these three measurments with your order.